When all was said and done (and eaten), and the judges’ marks were tabulated, on the podium at the Canadian Culinary Championships stood two Alberta chefs and our man from Ottawa. 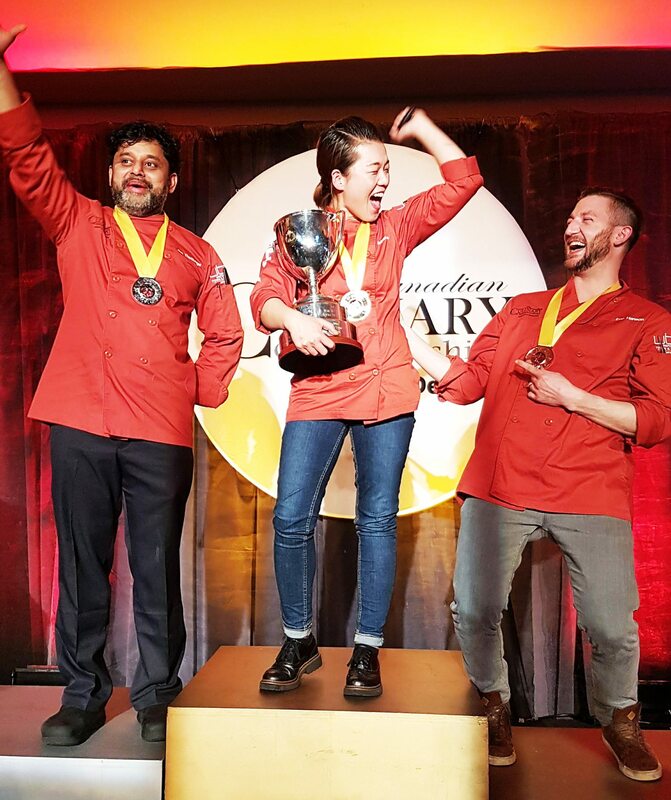 Calgary chef Jinhee Lee of Foreign Concept won the event — the first woman to take the top prize since 2007. The bronze went to Eric Hanson of Prairie Noodle Shop in Edmonton. And the silver, to Ottawa’s own Joe Thottungal from Coconut Lagoon. The CCC 2017 began last Thursday in Kelowna, B.C. Eleven chefs from eleven Canadian cities/regions, stretching from Galiano Island on the west coast to St John’s on the east, all Gold Medal Plates champions in their respective regional competitions, were each handed a smart red jacket, a bottle of mystery wine, and a wad of cash. Their task: to conceive a dish to match that wine and then to use the money to buy the ingredients to make it. The catch: there were 400 small plates to make, and the budget amounted to about a buck and a quarter per plate. To add to the burden, all ingredients had to be entirely locally purchased. To bump the fun, Kelowna provided a blizzard on shopping day. The wine, chosen by Ottawa Magazine wine writer David Lawrason (also National Wine Advisor for Gold Medal Plates), turned out to be from the Cowichan Valley on Vancouver Island. It was the 2014 Pinot Noir Reserve from Unsworth Vineyards, a wine versatile enough to allow chefs a wide field of possibilities. Just as the bottle is hidden, so too are the chefs: the wine-matching competition is judged blind. (Though the aromatic dish that arrived with mystery chef #10 – Indian spice-infused lamb, slow-cooked and finished with tomato, onion, and garam masala, and served with a swoosh of beetroot puréed with spiced yogurt – did rather suggest to me that it might be Joe’s …) On the plate as well, a potato-spinach-turmeric croquette with methi leaves, and a snowy confetti of puffed rice. I thought the wine did an admirable job handling the spice and heat in the dish. 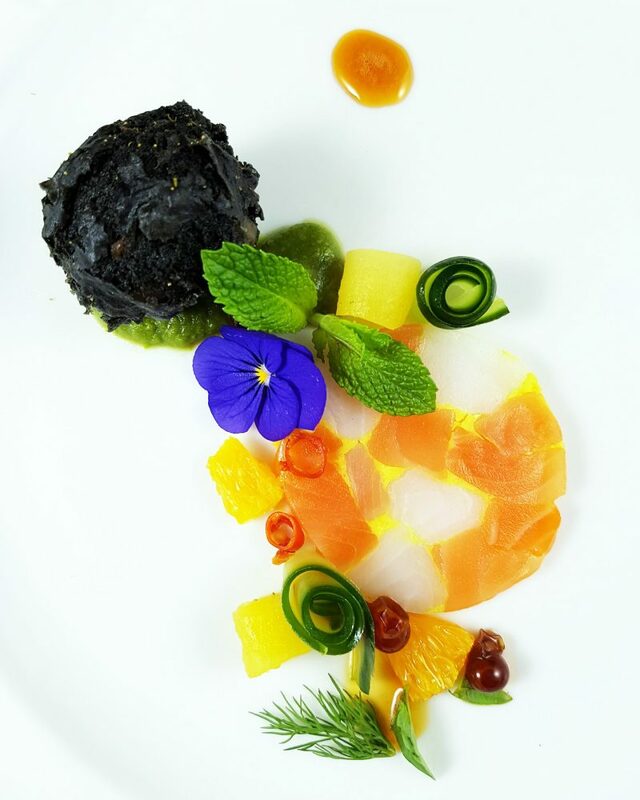 Next competition, on Saturday morning, was the Black Box in the Okanagan College kitchens. Joe drew the shortest straw, and was the final chef to open the lid and meet the contents. 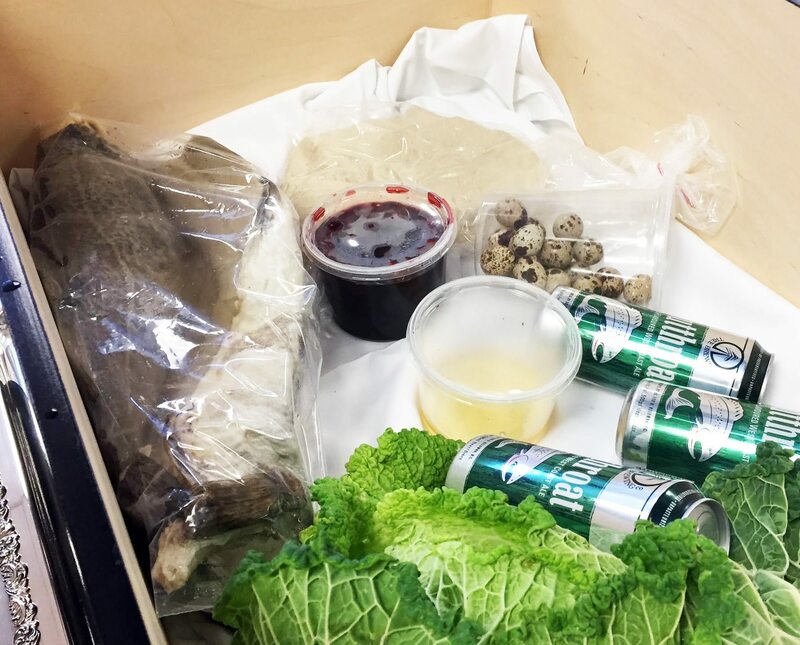 In that box: salt cod (pre-soaked), prairie honey, a Savoy cabbage, B.C. sour cherries, quail eggs, raw focaccia dough and a few cans of Cutthroat West Coast Ale from Tree Brewing Co. The instinct to sit down, guzzle the beer and panic must have been overwhelming. But no chef did, and all dishes arrived to the judges’ table within the allotted hour. 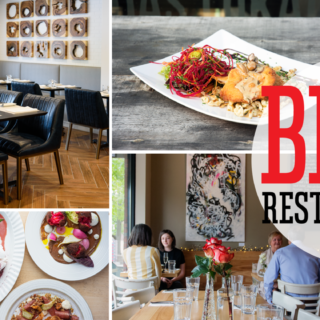 Those chefs that managed to tame the salt — and create dishes other than honey-glazed cod topped with a fried quail egg, served with cabbage-cherry slaw — rose to the top of the heap. 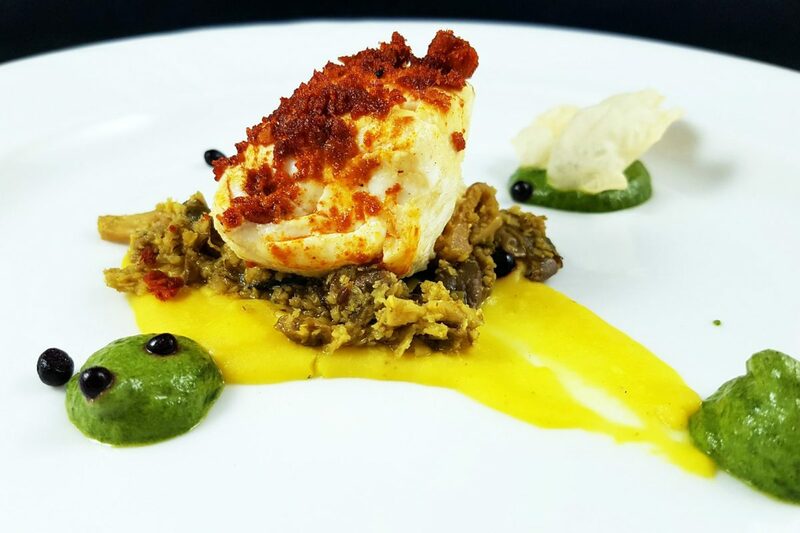 Joe and his long-time sous chef Rajesh Gopi elected to treat the fish two ways, poaching some filets in beer, and frying others with coriander seed, napping the soft and crunchy fish with a tomato essence cooked down with cumin and ginger. At the base of the dish was a spiced cabbage-carrot sauté, and around the plate, a chunky cherry-ginger-jalapeno sauce. 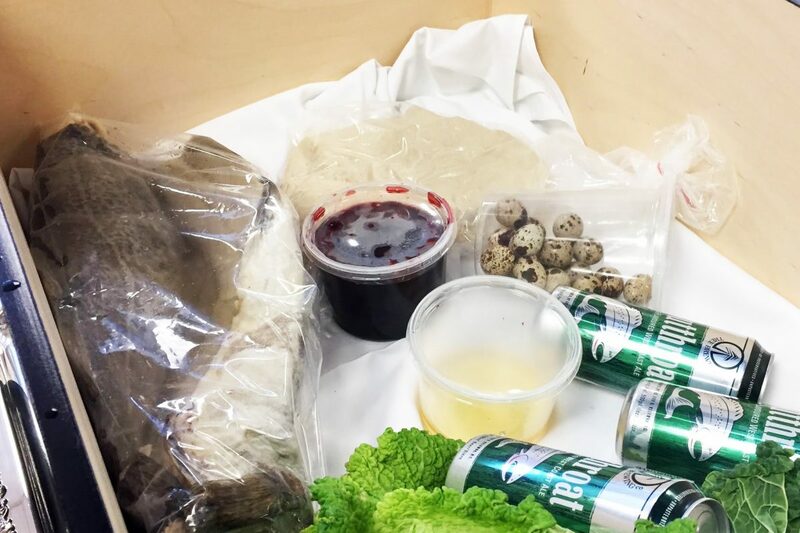 With the raw dough, the clever team made roti, kneading in mashed potato cooked with cumin and onion, rolling and frying and serving triangular wedges of it propped up on the fish. The dish was garnished with chives and cilantro leaves. Two competitions down; one to go. 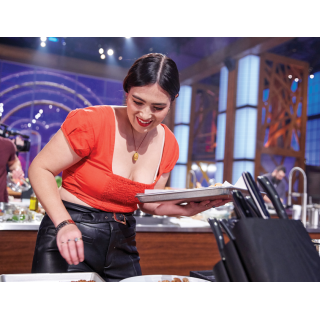 For the ‘Grande Finale,’ the chefs returned to the dishes — or to some semblance of the dishes — that won them gold medals in their regional competitions. Thottungal’s dish featured B.C. 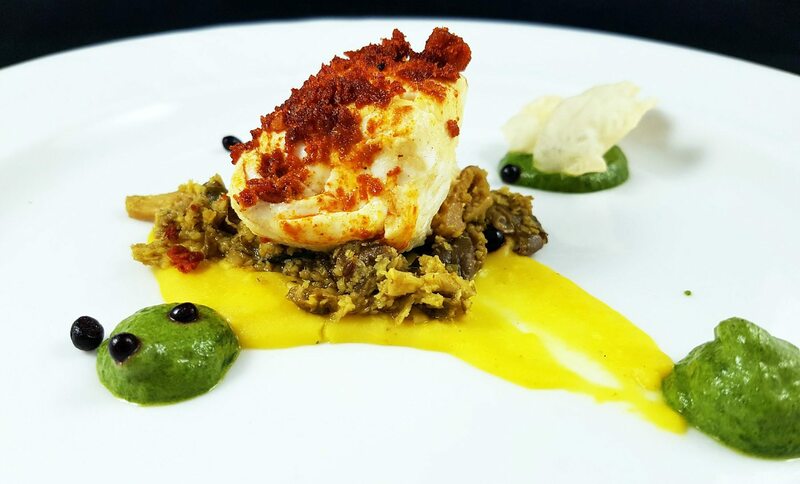 halibut, soaked overnight in green mango juice, then slow-cooked in an oil bath infused with Kerala spices. On top of the fish was a fabulous curry crumble, and around it a lentil emulsion, a spiced-spinach gravy, and a mushroom Aviyal (cooked in fresh coconut, with curry leaves). 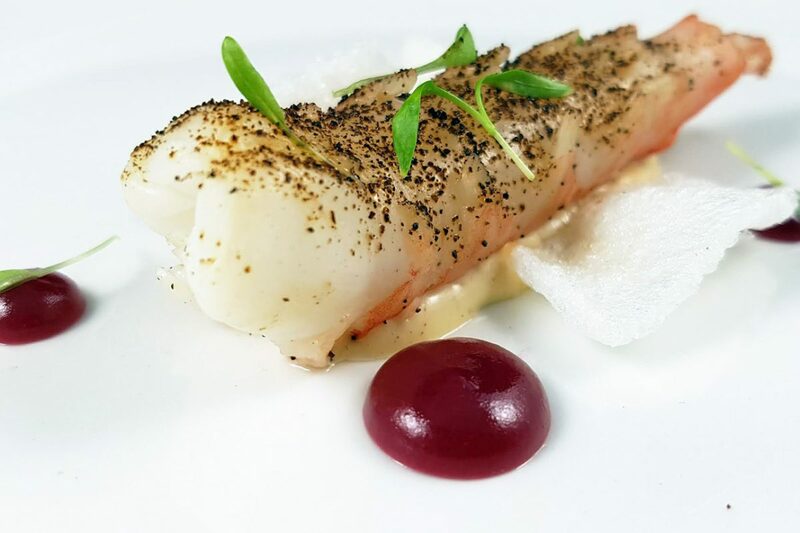 Ginger-spiked molecular pearls of beet juice and a maple leaf-shaped papadum “…in honour of the 150th birthday of our great country, Canada” finished the plate. Paired with the dish was the 2015 off dry Riesling from Huff Estates. 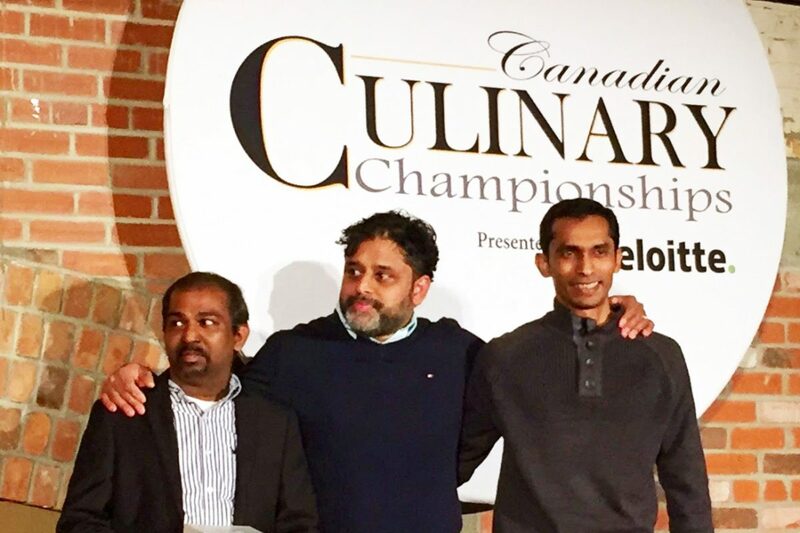 It was a wonderful weekend of wonderful food, capped with the absolute pleasure of seeing chef Joe Thottungal on that Kelowna podium. It was also a pleasure to watch a woman chef, Jinhee Lee – who had wowed us all weekend – win the event. It’s been 10 years since we’ve seen that. 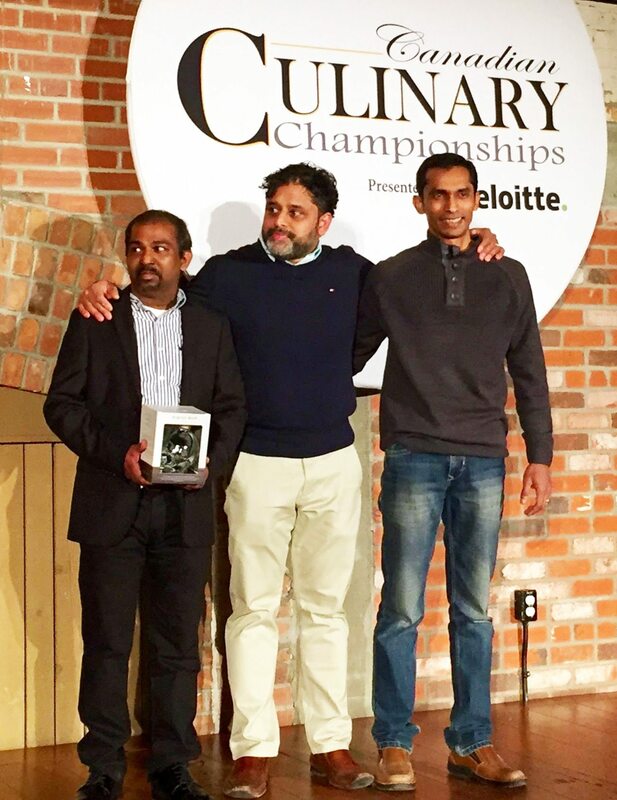 So huge congratulations to all the chefs, and particularly to chef Joe Thottungal and his Coconut Lagoon team of Rajesh Gopi and Sudeep Jose. You have made your city so very proud.